While many people on earth had their eyes to the skies, looking up for fragments of satellite UARS as she makes her way back home, the people of Wasdale were treated to the sight of up to a hundred unidentified flying objects hurtling their way off England's highest mountain. 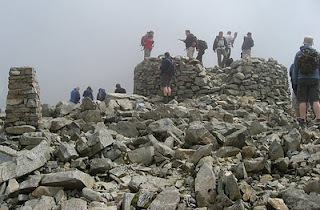 The Scafell Pike Race is 4.5miles and 3000ft. The record was set by Manx Missile Lloyd Taggart in 2007 and is a mere 49:50. Last year the race was won in 56:38 by Ricky Lightfoot. The ladies record belongs to Borrowdale's Nicola Davies and set in 1999 (1:03:24) which infact is 8 years after the UARS satellite was sent up into space. Can her record outlive the satellite? 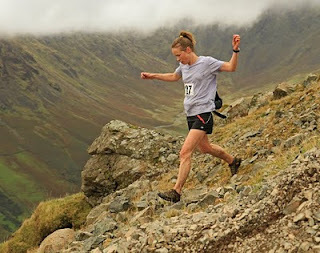 The Scafell Pike race is the last counter (and decider) in the unique King and Queen of the Mountains competition, being the Cinderella to its more flamboyant sister races of Snowdon and Ben Nevis. And there's a 'Jack and Jill' joint couples prize waiting to be won too, which looked like it went to Mike and Hazel Robinson this year. The results were brought to you by our 'news hound on Scafell' who ran the race, allowed himself the luxury of a quick cup of water then dashed off to find internet cover to tweet the news! Well done news hound @WTWilliamson.